English cabalist and mystic; born about 1708; died in London April 17, 1782. Some writers give Fürth, others Podolia (Podhayce), as his birthplace. 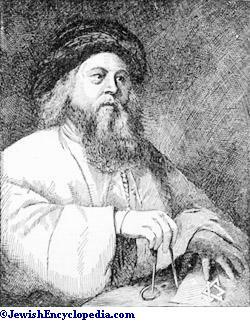 He was known as the "Ba'al Shem" of London. Falk left a diary, now in the library of the bet ha-midrash of the United Synagogue, which is a quaint medley of dreams, records of charitable gifts, booklists, cabalistic names of angels, lists of pledges, and cooking-recipes. 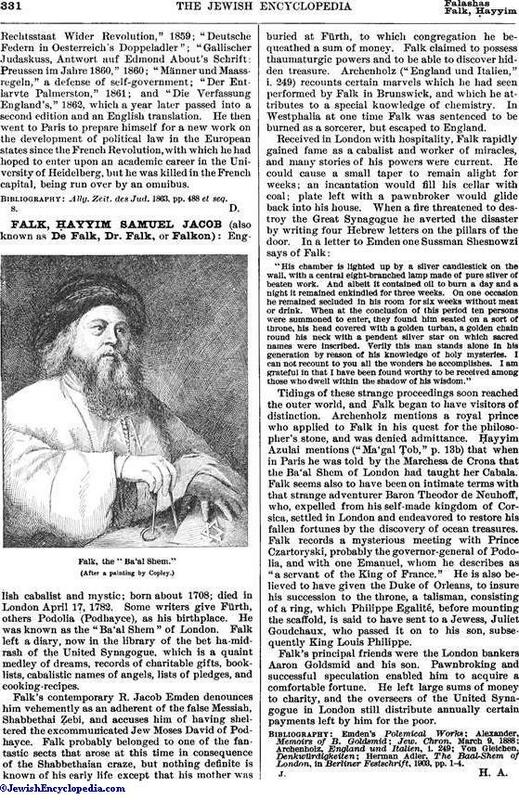 Falk's contemporary R. Jacob Emden denounces him vehemently as an adherent of the false Messiah, Shabbethai ẓebi, and accuses him of having sheltered the excommunicated Jew Moses David of Podhayce. Falk probably belonged to one of the fantastic sects that arose at this time in consequence of the Shabbethaian craze, but nothing definite is known of his early life except that his mother was buried at Fürth, to which congregation he bequeathed a sum of money. Falk claimed to possess thaumaturgic powers and to be able to discover hidden treasure. Archenholz ("England und Italien," i. 249) recounts certain marvels which he had seen performed by Falk in Brunswick, and which he attributes to a special knowledge of chemistry. In Westphalia at one time Falk was sentenced to be burned as a sorcerer, but escaped to England. "His chamber is lighted up by a silver candlestick on the wall, with a central eight-branched lamp made of pure silver of beaten work. And albeit it contained oil to burn a day and a night it remained enkindled for three weeks. On one occasion he remained secluded in his room for six weeks without meat or drink. When at the conclusion of this period ten persons were summoned to enter, they found him seated on a sort of throne, his head covered with a golden turban, a golden chain round his neck with a pendent silver star on which sacred names were inscribed. Verily this man stands alone in his generation by reason of his knowledge of holy mysteries. I can not recount to you all the wonders he accomplishes. I am grateful in that I have been found worthy to be received among those who dwell within the shadow of his wisdom." Tidings of these strange proceedings soon reached the outer world, and Falk began to have visitors of distinction. Archenholz mentions a royal prince who applied to Falk in his quest for the philosopher's stone, and was denied admittance. Ḥayyim Azulai mentions ("Ma'gal Ṭob," p. 13b) that when in Paris he was told by the Marchesa de Crona that the Ba'al Shem of London had taught her Cabala. Falk seems also to have been on intimate terms with that strange adventurer Baron Theodor de Neuhoff, who, expelled from his self-made kingdom of Corsica, settled in London and endeavored to restore his fallen fortunes by the discovery of ocean treasures. Falk records a mysterious meeting with Prince Czartoryski, probably the governor-general of Podolia, and with one Emanuel, whom he describes as "a servant of the King of France." He is also believed to have given the Duke of Orleans, to insure his succession to the throne, a talisman, consisting of a ring, which Philippe Egalité, before mounting the scaffold, is said to have sent to a Jewess, Juliet Goudchaux, who passed it on to his son, subsequently King Louis Philippe. Falk's principal friends were the London bankers Aaron Goldsmid and his son. Pawnbroking and successful speculation enabled him to acquire a comfortable fortune. He left large sums of money to charity, and the overseers of the United Synagogue in London still distribute annually certain payments left by him for the poor. Herman Adler, The Baal-Shem of London, in Berliner Festschrift, 1903, pp. 1-4.